A diagnosis of ADD or ADHD by a medical professional, usually results in a child or adolescent getting a hefty dose of medication. According to the United Mission Coalition for Children and Family, or UMUCCF, that could be the worst thing to happen. The terms ADD and ADHD refer to Attention Deficit Disorder, or Attention-Deficit Hyperactivity Disorder – both defined as brain disorders marked by “an ongoing pattern of inattention and/or hyperactivity-impulsivity that interferes with functioning or development”. This pattern, defined by the National Institute of Mental Health (NIMH), describes a fairly recognizable set of sometimes escalating behaviors which may alternate between lack of attention, or seeming indifference, and periods of manic activity during which victims are unable to control their impulses. According to the American Psychiatric Association, 5 percent of America’s children have ADHD. This figure can be found in the Diagnostic and Statistical Manual of Mental Disorders, or DSM-5, which defines and calibrates every mental aberration from toxoplasmosis/schizophrenia to Alzheimer’s. Other studies put the rate even higher, and indicate that it might also be increasing. For example, a 1997-2006 study from the Centers for Disease Control, or CDC, put the rate at 3 percent, as opposed to the above 5 percent, measured from 2003 to 2011. The rate also varies widely from state to state, suggesting an underlying diagnostic/reporting or environmental impetus. 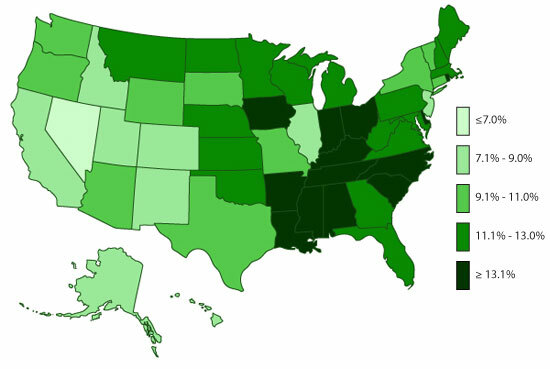 For example, the all-time rate for ADHD diagnosis during 2011-2012 was more than 13 percent in a swath from the Gulf States to North and South Virginia, and including Iowa. The same states recur on a map of recently diagnosed cases of ADHD, reinforcing the idea that the cause may be environmental, but data is lacking for a definitive conclusion. Kids will be kids. Since time immemorial, these youngest members of the human species have shared several traits, usually outgrown by the age of 25 or perhaps 30. These include an inability to sit still when bored –which may persist into old age; a tendency to forget coats, books, appointments and chores (another potential post-65 habit); and an inability to resist the temptation to pet someone else’s dog (or cat, or rabbit, or lizard, or even tarantula). This can also persist past 65, but none of these behaviors is an indication of a brain disorder. When children consistently forget, can’t focus on the task at hand, or fidget even during interesting moments in life, the problem may be ADHD. Doctors are busy people, and a fidgety 7-year-old may prompt a hasty (and sometimes inaccurate) diagnosis of attention deficit. The next step, in the minds of many pharmaceutically-focused doctors, is to prescribe a pill. This runs contrary to American Academy of Pediatrics (AAP) guidelines, which suggest behavior therapy first. But there is a certain intuitive logic in prescribing a pill for a pill, and the medications currently available work well. More relevant, busy parents may not always have the option of delivering their child for behavioral therapy weekly, or participating in some portion of that therapy to reinforce behavior-response recommendations. Finally, therapy is expensive – certainly more expensive than even the priciest pharmaceutical. Also, therapists may vary in their ability to change ADHD behaviors for the better. Medications may also vary in their effectiveness, of course, but it’s easier to change a prescription than it is a therapist, and this is no doubt one of the best reasons why behavioral therapy runs a distant second to chemically mediated behavioral modification. One of the most reputable online medical resources recommends starting youngsters on a regimen of low–dose of stimulants like Concerta, Metadate, or Ritalin. Here again, a stimulant may seem counter-intuitive, but in fact stimulants act like “brakes” in the ADHD brain. Parents who allow their children to sip coffee have often noticed this unexpected effect. For youngsters who don’t react well to stimulants, doctors may prescribe such “second generation” behavioral modification drugs as Atomoxetine (a selective norepinephrine reuptake inhibitor, or SNRI), Kapvay, or Intuniv, both alpha-2A-adrenoceptor agonists. Finally, antidepressants may help children who have ADHD and symptoms like anxiety or insomnia, though caution is urged.